The photograph collection contains over 5000 photos of Woods Hole and Quissett going back to the 1850s, including family albums and photos, village scenes, boats, yachts, steamships, pictures of the early days of the scientific community starting in the 1880s with the U.S. Fish Commission and the Marine Biological Laboratory, as well as albums showing MBL activities in the 1920s and 1930s. You can browse through over 3000 photos from our collection by clicking here. A prized part of the photo archive is the Baldwin Coolidge Collection. 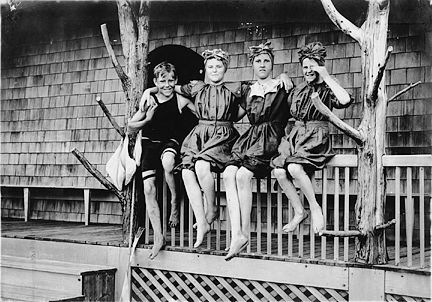 Mr. Coolidge was a Boston photographer who worked extensively in the Woods Hole area from the early 1890s to about 1910. Our collection of his works contains 100 original prints and two glass plate negatives, as well as 100 more sepia and black and white copy prints. The Museum has published a book of Coolidge’s photos, New England Views: The Photography of Baldwin Coolidge (1845-1928).